We carry windshield parts for RVs made in the year 2000 or newer, with everything from streak-free blades to hooks, adapters and wet kits. 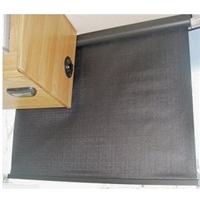 The majority of our motorhome windshield parts are universal, meaning they’ll fit on popular brands such as Monaco, Holiday Rambler, Fleetwood, REV RV, Tiffin Motorhomes and more, but be sure to review product specifications to confirm. If a product won’t replace your old part, we can likely order what you need. Just fill out our online form and we’ll be in touch! We also offer full RV windshield replacement at our Grand Rapids, MI, location. If you’re interested in our service, review these details on replacement motorhome windshields and contact us for a quote. Whether you’re replacing your windshield or buying motorhome windshield parts, we’re happy to answer any questions you may have. Shop today and contact us if needed.